Click here to buy Falling Plus on Steam right now! Peppy the Penguin was just minding his own business. Suddenly, Wally the Walrus is trying to get in, and he's making a big mess, to boot! Blocks of ice are dropping from the ceiling, and from time to time, Wally is too! If Peppy doesn't match the colors carefully and work quickly, he'll be buried under a mountain of problems! Can Peppy clean up the mess and get rid of the intruder? It all depends on you and your reflexes! 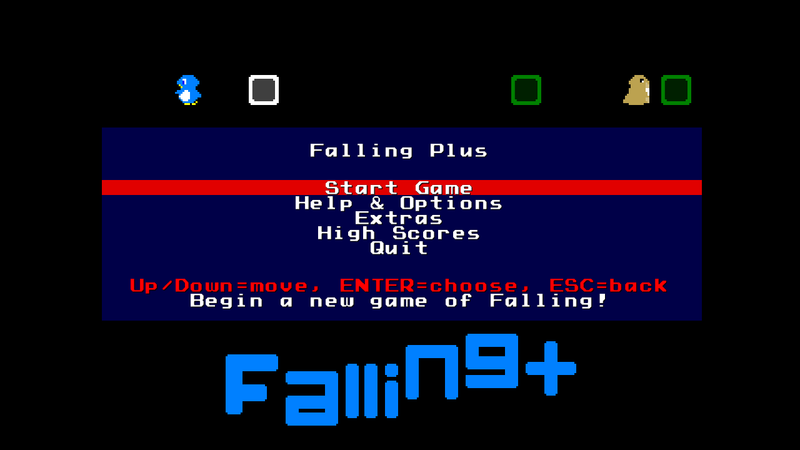 This re-release of yyrGames' 1980s arcade-style game Falling features sharper graphics, bonus modes, keyboard controls, and more! 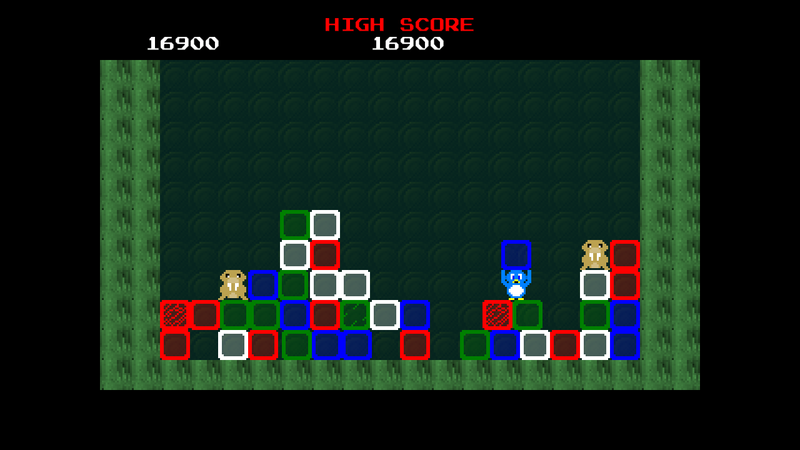 And it's the very first yyrGames release on both PC and Mac! In this fast-paced action-puzzle game, your task is to dodge the falling blocks and enemies, then eliminate them to clear the round and move on to the next! 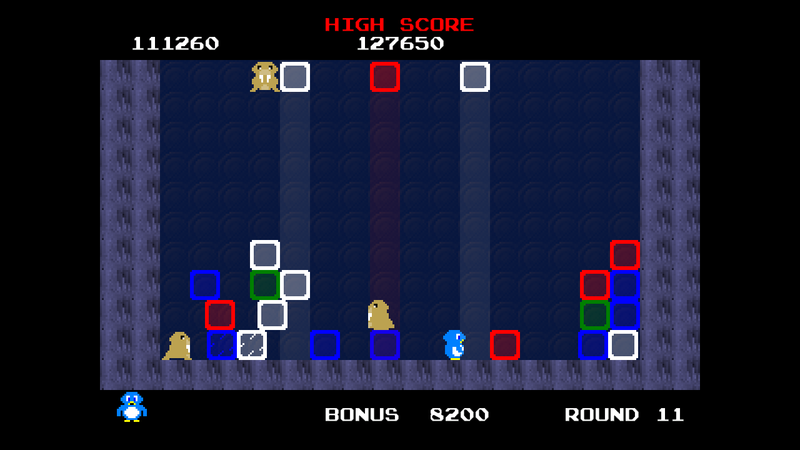 Kick or throw a block into a second block of the same color to eliminate both. 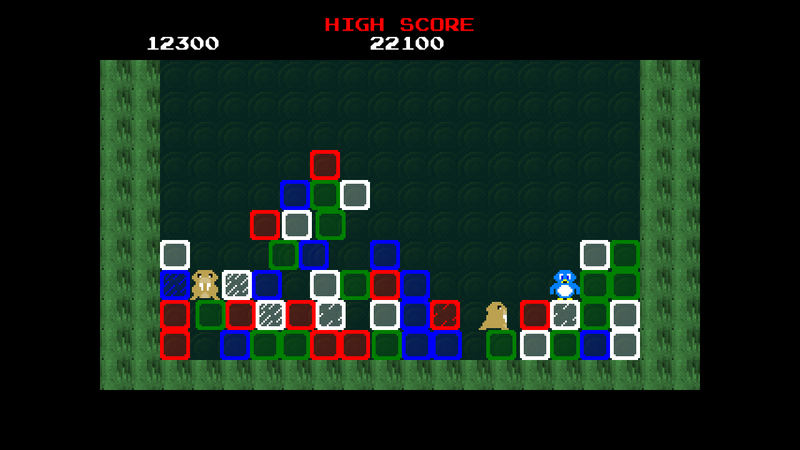 You can also push blocks, and drop them in front of or below you. Get to know these skills, then use them quickly! You'll need to take care of the mess on the screen, even while more of it drops from the ceiling! And just when you think you've got things under control, Wally shows up to make things more difficult! Push, kick or throw blocks to crush him before he causes trouble! At first, Wally's not much of a threat, but in later rounds, he'll be able to jump over blocks, push them around or even kick them back at you! Wally, however, is no match for careful planning, quick reaction time and a cool head! Just make sure to take care of the mess before the bonus timer drops to 0. If you can, the bonus is yours, but if not, you'll be playing with fire! And if for some reason you find Falling too easy, turn on Hard difficulty and see how long you can last! 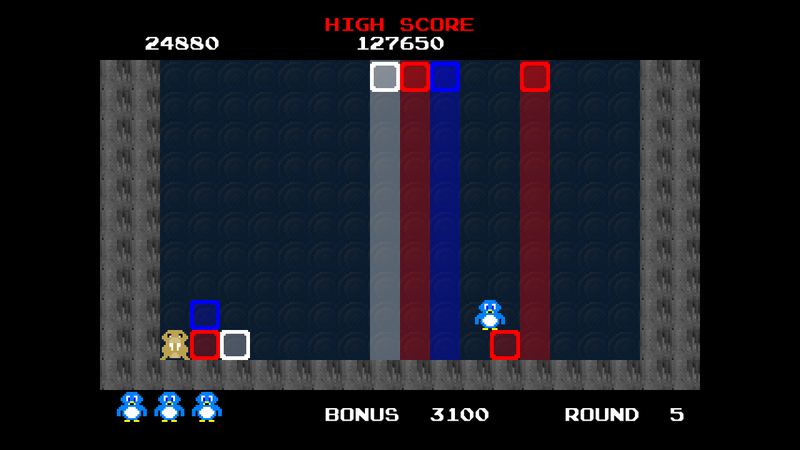 Falling Plus is a retro-style arcade game with an optional emulator-style presentation. You'll think you've traveled back in time! The fun gameplay is backed up with sharp, colorful graphics, and genuine retro music and sound effects, created on a Commodore 64! But you also get modern features such as customizable gamepad or keyboard controls, full support for all resolutions, and a fun set of Steam Achievements! Plus, compete for records on six different Steam Leaderboards! Falling Plus improves further upon the original XBLIG version with two additional bonus modes: Survival Challenge and Burning Igloo Challenge! In both, you get one life and must survive as long as possible under difficult circumstances. Survival throws you into a challenging level that never ends, while Burning Igloo sends fire down along with blocks and enemies! This fun, addictive game costs just $1.99 US! Falling Plus is now available on Steam! Falling didn't sell very well. But I felt that the game deserved better than to disappear forever following the end of XBLIG. Perhaps another chance with a new audience might help, I thought. So I dusted it off. 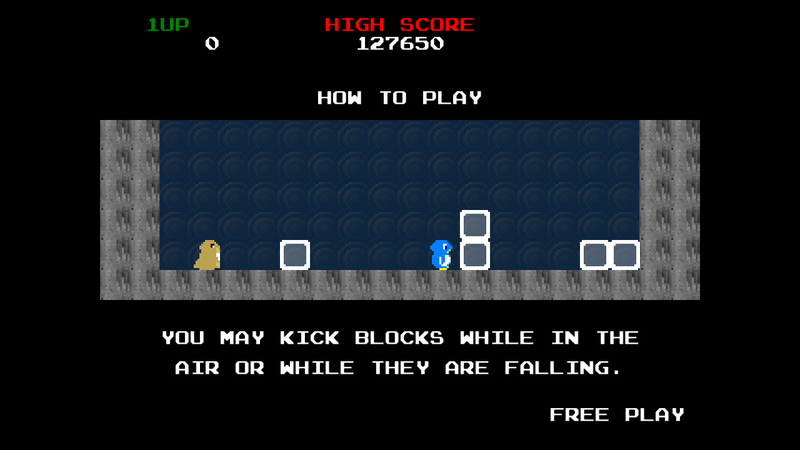 I fixed some issues, made some improvements, tweaked the controls. 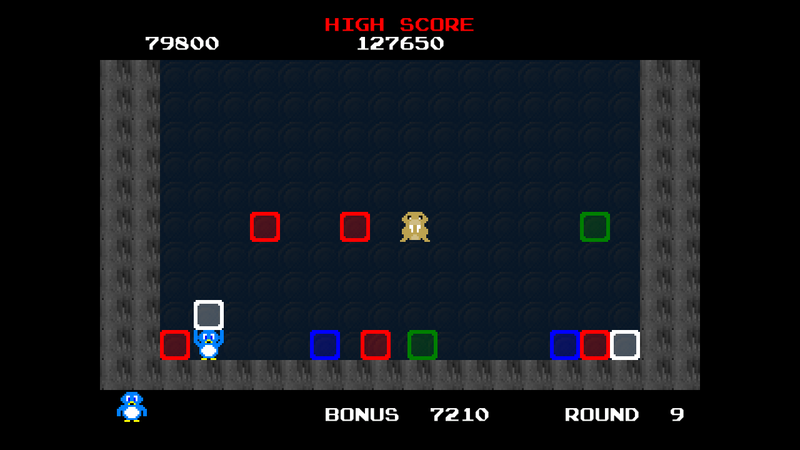 I sharpened the graphics, modernized the engine somewhat, and added some extra features. 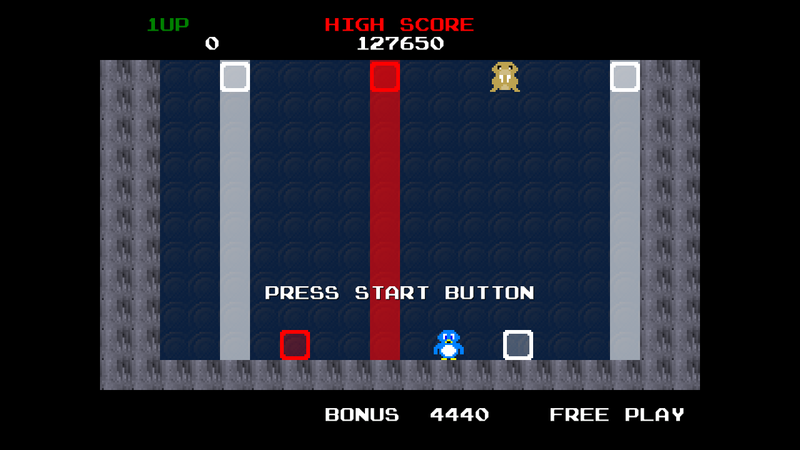 What I can now bring to you is the definitive version of this game, playable quite easily on your computer using either gamepad or keyboard. It may not be a game everyone will remember 50 years from now, but if it brings a smile to your face even once, then the effort was worth it. At least, that's how I feel about it! 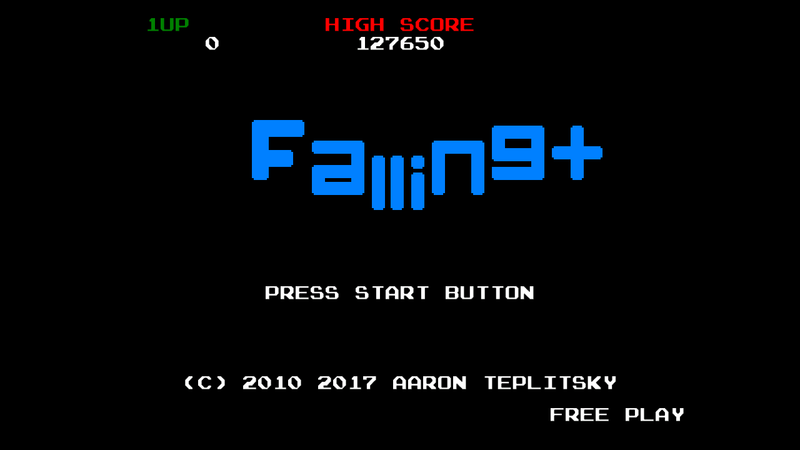 So please enjoy this new version of Falling, my lovingly-crafted rendition of a classic 1980s-style arcade game.